By default, Microsoft Outlook, such as Outlook 2010 and Outlook 2013, displays the number of unread email messages residing in the mail folder to the right of each mail folder, with the exception of Drafts, Junk E-mail and the For Follow Up search folder. 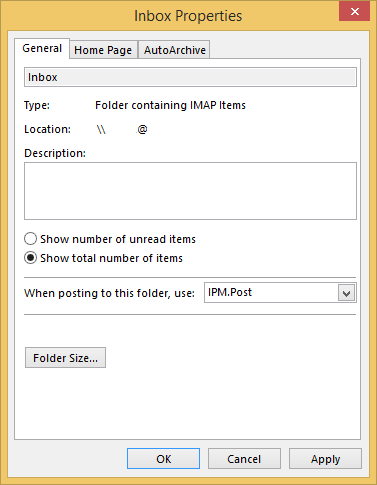 In Outlook’s Folder pane, right click on the folder which you wants to show total number of email messages instead of unread messages count. Select Properties from the contextual menu shown. Select the General tab (if not selected). Select Show total number of items. When you change to display total number of messages, the number is shown inside square brackets, i.e. , comparing with number in bold without bracket or number in parentheses (depending on Outlook version) for unread email messages count. The behavior allows you to visually identify whether the number reflects the total messages count or the total unread messages count. Outlook can only display either total number of messages or the number of unread messages for each folder. However, some folders, such as local folders (for POP email accounts), Drafts and Sent Items, the total items, unread items and/or header items in view can also be displayed in Status Bar. 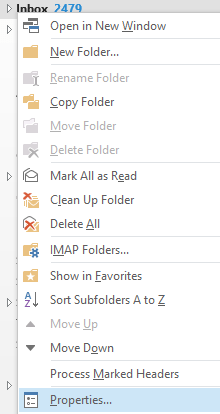 In addition, you must repeat steps above for each folder that you want to change as Outlook does not support simultaneous change of multiple folders at the same time. Note that if you added the folder to Favorites, the setting of total items or unread items apply to what’s displayed in Favorites too.